It’s that time of year again, at least for coastal communities and areas of Canada. A number of marine-based offshore industries are getting ready to gear up and head out for what promises to be a busy working season – with an expectation of safety always at the forefront of people’s minds. With the idea of safety, however, comes communication, and Nova Communications has everything you would need and more for doing just that. One key tool for offshore industries is, of course, the satellite phones. Once seen as a tool for people looking to live the adventurous life, satellite phones have now become an effective means of keeping crew members safe. They operate globally, including in remote areas, which is perfect for those needing to keep in touch offshore, while also providing vital information like up-to-date weather report capabilities. There are some factors to consider, however, when you’re looking at using satellite phones for communications. Depending on the service provider you choose, some require the phones to have direct lines to the satellite, while others have better quality by transmitting calls between satellites. You and your crew can work with our team of experts to determine the best options for your needs. But did you know that your options with satellite phones include both renting and buying from Nova? If your season is short, you may want to consider a rental – which also allows you to test out the equipment you’re using before making a purchase, keep the cost lower and choose the best service provider for your requirements. Buying, however, requires some considerations as to your requirements for the phones. We have seen great success in the usage of satellite phones from our customers. In fact, the crew of sailors rescued off of Sable Island in 2011, purchased satellite phones from us in the days before leaving to go to sea. While it’s not known if the team used their satellite phone for their mayday call, it is known that they understood the importance of having the tool on board. While on the vessel, and as a source for communication among crew or team members, there are great Motorola two way radios that will do the trick. With a name like Motorola, you know you’re getting a product that will hold up to the heavy work days offshore, while providing incredible audio capabilities, potential for noise canceling to prevent miscommunication in rugged work environments, and intrinsically safe and waterproof options as well. Renting of two way radios is also an option, which provides you with the advantage of testing out equipment to see if it will work for you, and getting the latest and greatest in technology. We can also work with you to determine the best radios for you – both offshore and on. There are also accessories available to accommodate your needs offshore, including speaker microphones for quick messages, headsets, spare batteries and lots more. Speak to one of our two way radio experts to find out more. Communication offshore, especially in areas without cell phone towers and strong WiFi access can be a challenge, but by working with Nova Communications, you can be sure to stay in touch – both on the vessel and with your team or family members back home. Contact us today to determine how we can help you make the most of your industry needs or start by looking at the brochure below, which features one of the many options in satellite phones available from us! 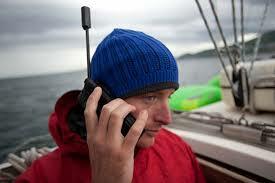 I think I would feel a lot safer if I knew I had a secure way to communicate with other people while I was offshore. I also like how you mention that satellite phones can provide weather reports too. That would be nice to have. Are these phones battery powered, or will they need to be installed and connected to a main power source? Satellite phones are battery powered, and have good life (depending on use), but are charged with a main power source when needed. Hope this helps! I like that you included the fact that your satellite options include buying or renting a phone. These phones are a big help for working in remote locations, but they can get pricey. If you only need one short term I would highly recommend renting. Great article!